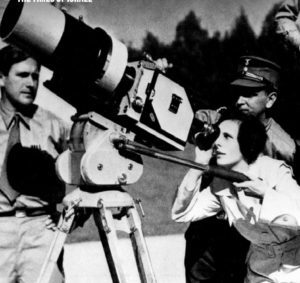 Following Riefenstahl’s post-war rehabilitation — she was never convicted of being a Nazi by the Allies — she made a secret deal with Transit Films and government officials to receive royalties from her Nazi-era projects. Riefenstahl felt no need for “atonement” along the lines of Hitler’s armaments chief, Albert Speer. Well into her golden years, Riefenstahl vigorously sued people who claimed she had been a Nazi. When Germany invaded Poland in 1939, Riefenstahl arrived on-site as a war correspondent. As the army swept eastward, she witnessed the execution of 30 civilians in the town of Konskie, as well as the murder of Jewish grave diggers. With photographs placing her at the scene of the crime, Riefenstahl later claimed she had attempted to halt the execution, and that she went to Hitler in order to express her indignation. 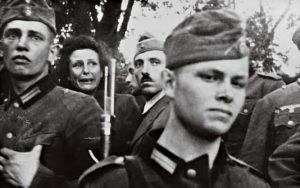 A few weeks after Riefenstahl witnessed the execution, she filmed Hitler’s “Victory Parade” in Warsaw, in which her patron viewed his forces marching through a bombed out city. Riefenstahl’s film work intersected with the Nazi genocide machine during two years of production on “Lowlands,” about a dancer courted by two suitors. For that project, the director personally selected more than 100 “extras” from among Roma and Sinti concentration camp inmates in Austria. After a 1942 film-shoot that used dozens of these victims, they were deported to the death camp Auschwitz-Birkenau, where most of them were murdered. For all her efforts, Riefenstahl was not able to release “Lowlands” until 1954. Decades later, at the age of 90, she negotiated the video release as part of “The Leni Riefenstahl Collection.” For having claimed she knew nothing of the Roma and Sinti victims’ deportation to Auschwitz, the director’s 100th birthday was marked by a Holocaust denial lawsuit against her, filed jointly by some of the child survivors used as extras on her film. Beginning in the 1960s, Leni Riefenstahl’s come-back period included a stint photographing the 1972 Munich Olympics, as well as giving interviews in which she distanced herself from Hitler. She always denied having been an anti-Semite or having known about the murder of six million Jews during the Holocaust. While the Berlin Museum of Photography has yet to announce specific plans for the Riefenstahl exhibition, a team of experts is examining the content of her archive’s 700 cases. 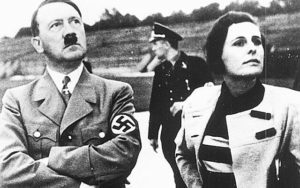 Historians doubt the documents will offer new insight into her wartime activities: Riefenstahl would have destroyed incriminating evidence long ago. Since 2004, the museum has housed a collection of photographs by Helmut Newton, a Jew who fled Berlin as a child in 1938. Later in his life, Newton came to admire Riefenstahl’s films, and the two became friends. Some of their letters to each other are on display at the museum alongside images taken by Newton, who was known as Germany’s “King of Kink” for posing women in sexually provocative scenes. According to critics of the planned Riefenstahl installation, the friendship between Riefenstahl and Newton, a Jewish photographer, does not “excuse” the glorification of her life and Nazi films at the museum. By displaying items from Riefenstahl’s estate, the museum — wrote one observer — is helping the filmmaker “dupe” the public yet again, albeit posthumously. 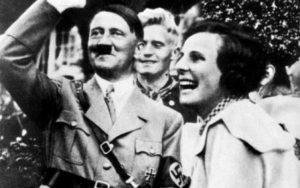 “Those who see anything to admire in Riefenstahl’s work, which was mired in fascistic content and sensibility, have been duped again just as she, and those who supported her, wanted,” according to Brian Winston, a journalist and film professor at Lincoln University in Britain, in a Guardian article. “It’s an absurd and disgusting obscenity that the estate of Hitler’s favorite filmmaker is to be given a home in the foundation of a man who was forced to flee Nazi Germany because he was a Jew,” said Winston.